In 1925, a $5 million Peabody, designed by noted Chicago architect Walter Ahlschlager, opened at its present downtown Memphis location on Union Avenue. The throngs of people that regularly gather in the lobby of The Peabody Memphis are not competing for a prime vantage point from which to photograph a rock star, movie celebrity, or noted political figure. They are eagerly awaiting the arrival of five Mallard ducks. 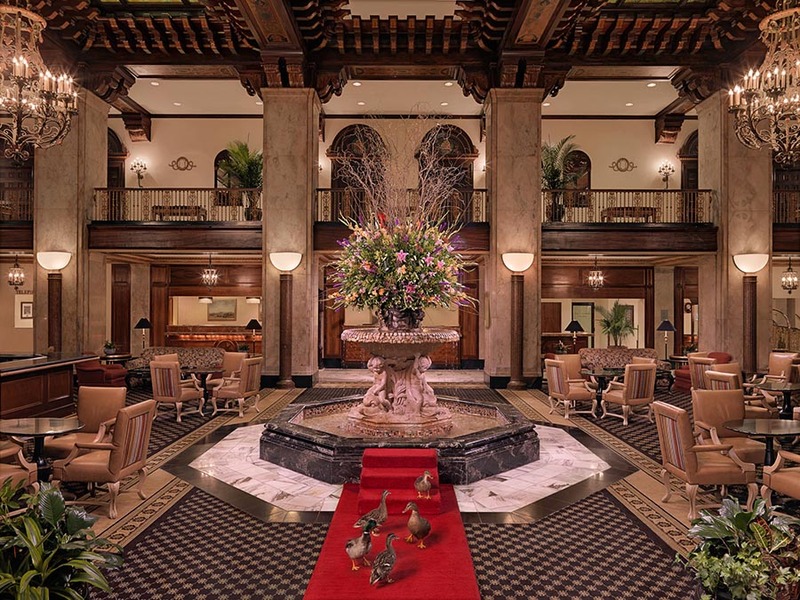 The “Peabody Ducks” that live in enviable comfort in the “Royal Duck Palace” on the hotel rooftop make their celebrated twice-daily trek through the lobby and into the fountain of the luxury hotel that has been part of the Memphis skyline in its present location since 1925. It takes more than a parade of ducks, however, to create a truly grand hotel and attract visitors from as far away as Australia, New Zealand, and Japan as well as local residents looking for the perfect “Staycation” in their own city. 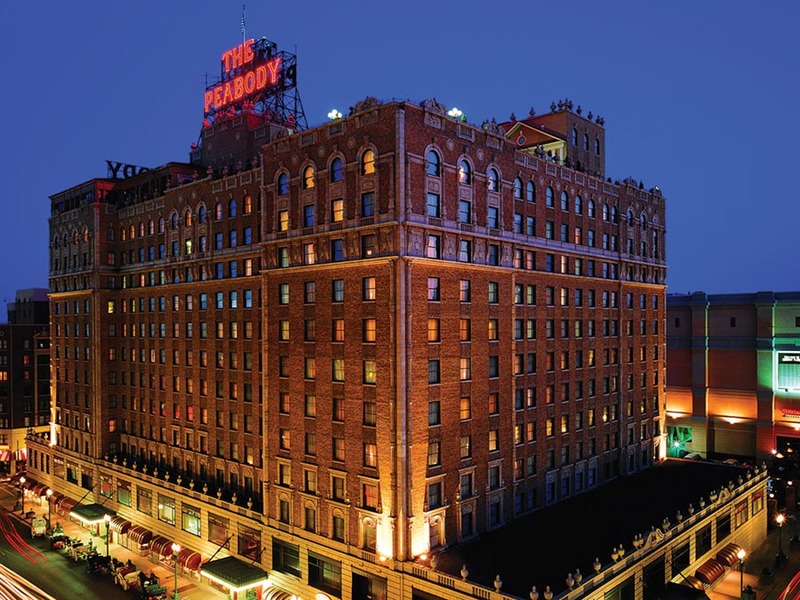 The Peabody has evolved over the years to become the only Forbes 4-Star, AAA 4-Diamond hotel in the Mid-South. The Peabody has also played host to a variety of special events ranging from displays of new cars (and even livestock!) to the senior prom of a teenager who would re-write musical history – Elvis Presley. The Peabody’s Grand Lobby fountain, where its resident ducks splash and play throughout the day, is cut from one enormous piece of travertine marble made and shipped from Italy for the hotel’s 1925 opening. After the American Civil War ended in 1865, Memphis became one of the fastest growing cities in the South. Local businessman Colonel Robert Campbell Brinkley opened the original Peabody Hotel in 1869, naming it after his good friend, George Peabody, a well-known philanthropist. In 1925, a newer and grander Peabody was built at its present location at Union and Second Street. The Peabody changed ownership multiple times in the 1960s and 1970s. In 1974, during downtown Memphis’ social and economic decline, The Peabody closed. Rebirth came in 1975 when the hotel was purchased by Belz Enterprises, who began a five-year, $25 million renovation. Jack Belz, along with sons, Marty and Ron, continue to own and operate The Peabody today. 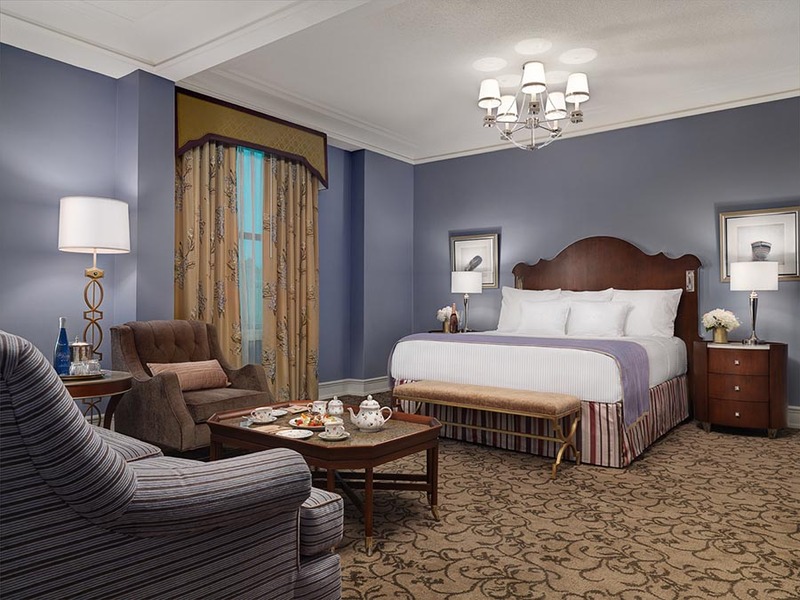 The Peabody Memphis has undergone numerous redesigns and enhancements since 1869, but the luxury hotel’s guestrooms have always remained faithful to its past while keeping an eye on the future. Located in the heart of downtown Memphis just two blocks from Beale Street, the 13-story landmark contains 464 rooms, including 15 sumptuous suites. Amenities include a full-service luxury spa and salon (appropriately called Feathers Spa), 80,000 square feet of state-of-the-art meeting space, and five shops. Guests can choose from dining options including Peabody Deli & Desserts and two upscale restaurants, Chez Philippe and Capriccio Grill, and socialize at the cozy Corner Bar and the famed Lobby Bar.